DPI College Scholarship Program | Delmarva Poultry Industry, Inc.
Want to support this scholarship for future leaders of the industry? 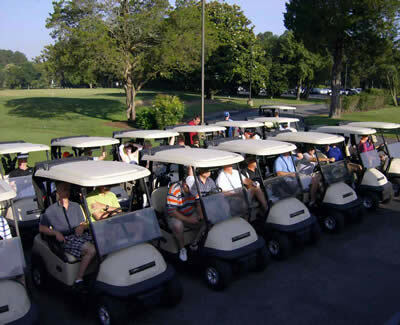 Come play golf with us, or claim a sponsorship opportunity, during DPI's annual College Scholarship Golf Tournament on Wednesday, June 5, 2019 at Green Hill Country Club near Quantico, Maryland. Money raised through this day of fun and competition will be used to fund DPI's college scholarship program. In recent years we have provided tens of thousands of dollars for scholarships to students who have an interest in the chicken industry. We can only do that with support from interested individuals and companies wanting to enroll teams or make donations. We'll have two flights...one starting at 8:00 a.m. and the second at 1:00 p.m. Teams will compete for prizes of best gross score and best net score. We'll have closest to the pin, longest drive, and straightest drive contests. Players have the chance to improve their game through the purchase of mulligans and red tee coupons. All male golfers will use the white tees; female golfers will use the red tees. Handicaps will be used to determine winning teams. The $100 per golfer charge includes greens fees, carts, on-the-course beverages, lunch, and prizes. A variety of sponsorship packages are available and being sought to help us provide more scholarship money. Door prizes for awarding at lunch are being sought as well. Questions or problems? Contact Maureen Duffy at duffy@dpichicken.com or 302-856-9037. Click the button below to register tournament players, secure a sponsorship package and make a door prize donation. Since 1985, DPI has awarded more than $120,000 to college and graduate students through its College Scholarship Program.